Whimsical Garden Art..."Express Your Individuality"
**Whimsical Garden Art** ..You probably know it as "Recycled Art", "Scrap Art", "Junk Art", "Trash Art", "Altered Art", or "Salvaged Art". It doesn't matter what you call it. It's all Whimsical Garden Art. "Whimsical" What a "HAPPY" word. The definition of whimsical is: Full of "whim" which is, a sudden wish, change of mind, impulsive, or fanciful. The word "Whimsical" puts a smile on your face. "Whimsical Garden Art" establishes a fanciful mood in your garden. How many times have you been sitting in your garden thinking to yourself, "If I only had more color around the deck or maybe a little more sparkle by the back door?" I would bet that it's almost every time that you're in your garden. I use to think the same way, until one day about five years ago, I got a "Great Idea"
A lot has happened since that "Great Idea" happened, but to this day I still get a smile on my face whenever I look at the first suncatcher or hear the first windchime that I ever made. Whimsical Garden Art is very popular. From Martha Stewart Living to Carol Duvall. Art and Craft ideas are everywhere. The art of creating has become very popular. It is relaxing, interesting, fun to do, and fun to share. 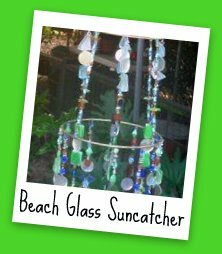 As with my Beach Glass Suncatcher, below. I found the glass while I was "shell hunting" on the Boliver Peninsula, during a summer vacation. It was fun to make and hang in my garden because it held lots of good memories. When my daughter and I get together, we love to "create whimsical garden art". Of course she never brings her supplies, she always wants to use mine. Ha..kids! Everyone loves to have a place where they can kick off their shoes and let their hair down. Your garden can be that place. There are three ways that you can go about decorating your garden. One is to create your own art. Two, is to purchase items to decorate with. Three, is to do both. That is what I do. Before you start placing your ornaments in your garden, find a focal point. It could be your outdoor furniture, a fire pit, an outdoor swing, or anything that you can build your ideas around. You can also purchase your decor according to a particular "theme". For example: victorian, country or shabby chic. Just remember it's what "YOU" like. I have a sitting area where I have two tables and some chairs. When we have outdoors dinners, this is where everyone congregates. I used this area as my focal point. So, with very little work I enclosed the area with all my potted plants. I put the tall plants in the back and placed the ferns and flowering plants like the impatients and begonias in the front. Then, I hung a bird house and a suncatcher, and placed a few other pieces of whimsical garden art around in different places. Now it is a happy place that I am very proud of. Oh yea, My friends love it too. Some of the "Whimsical Garden Art" that you might want to include in your garden is windchimes, bird houses, bird bath, metal art and/or wind art, just to name a few. You will want to put some thought into where you place your art. Be creative, don't clutter, and have a few surprises, like a path that leads to a "fairy house". Just have fun with it. Remember to make it comfortable and inviting. If you take the time you can design a very inviting space that you will want to visit often. As you look through my website and then browse through the "Goodies Store" you will see that I take pride in all the garden art that I construct. I know that you'll be surprised when you see some of the items that I consider whimsical garden art, like fire pits and swings. ...And Goodies? yes, I have included lots of goodies. So, grab a cup of coffee, sit back, relax and enjoy all the information and all the lovely photos and products that I have included in my website. There is "Whimsical Garden Art" almost everywhere you shop, but for "REALLY" exceptional, one of a kind, products, please visit the websites that I have included on this page and each page of my website. My friends have many beautiful items for you to include in your garden. I know that you will get some good ideas and find some garden art that makes you smile and someone you know, smile too! Goodies eStore1 , A store filled with wonderful and fascinating garden art. Suncatchers have come a long way baby! The "boring" suncatcher is out and the "new" kids in town. Stained Glass Suncatchers are a kaleidoscopes of colored glass, beads, and mirror pieces. Crafts are all the things I like to make. Terrarium is a little garden, made inside a glass container. Polymer Clay is a substance with the texture and workableness of clay. Whimsical Birds is about how birds are used in ART. Birdbaths are... "Da BomB" and an excellent way to attract birds to your garden. I make a beautiful mosaic bird bath, but to be fair there are many styles and materials to choose from. 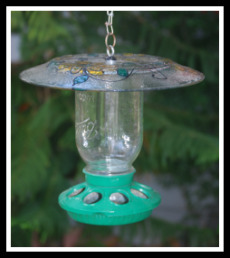 Birdfeeders are the most sought after garden items. If the wooden bird feeder is not your style, don't worry, They come in all shapes, sizes, and materials. Whimsical Garden Art : Junk Art, Trash Art, Recycled Art, Scrap Art, or Altered Art. It covers it all. Wind Art, includes wind chimes, wind sculptures, whirligigs and wind spinners. The theme is, if you can't tell, is art that is effected by the wind. Spinners as in "Wind Art". They are sometimes called "Wind Spinners" or "Wind Wheels." Weathervanes, History, Express your artistic side with an old world piece of art. More Weathervanes, beautiful pictures of wonderfully designed garden art. Sculptures has the best decorations for your garden.Statues, gazing balls and more. Water Gardens or water features, no matter what you call them, water always add a certain ambiance to your garden. Balcony Gardens and Patio Gardens. Small gardens are very popular these days with many people moving into apartments and condos. Rooftop Gardens are full of charm and are fun to share. Herbs, growing herbs is a wonderful way to connect with nature and it is very useful too. History of herbs is where our medicine of today began. Herb Gardens are fun, useful, and create a certain ambiance to your outdoor playground. Ponds or Garden Ponds are Nature's magic. Water features make beautiful additions to your garden. Plants and Fish for your garden pond can be as extravgant or as simple as you want it. Porch Swings, Memories on a chain. Landscape Lighting is wonderful. Choose from a wide range of styles. You can put the spotlight on one partidular item or light up your entire yard. Outdoor-Lighting-Systems are the three (3) way,s in which to set up lighting for your garden area. Torches, Add warmth and ambiance to your garden area by placeing torches down a path or along a driveway. Anywhere that makes you happy. Patio Heaters, extends the outdoor gatherings for many more months.Your place for friends and family just got better. Outdoor heating makes your activities more pleasant. Wood Burning Heaters like the very popular Chiminea, Fire Pit, or Outdoor Fireplace. A Great addition to your garden. Gas Patio Heaters, is fast becoming as common as the outdoor grill. It will extend your summer for many months. and it is a wonderful addition to your garden area. Mailboxes are hand painted,personalized,and are different than any your've ever seen. Bird Mobile, Create a colorful bird mobile with your kids. The wonder is only halted by the limits of your creativity. Pine Cone Bird Feeder, a fun bird feeder that you can make with your kids. They will love it and so will the birds. Egg Shell Mosaics,make a mosaic with colorful dyes and egg shells. Seed Mosaic, creating a mosaic using seeds, beans, shells,or pebbles. 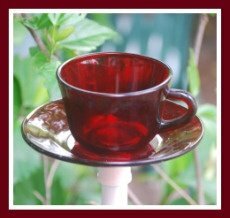 Cup Cake Bird Feeder is a great way for you and your kids to bond! 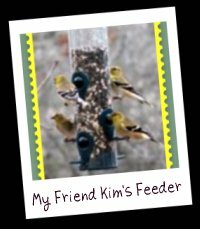 Make this feeder and the birds will love you! Weathervane Craft, Make a Folk Art Treasure and learn something about Science all at the same time. All About Me lets you know a how I got to where I am today. Would you like to share your knowledge about whimsical garden art? Great, find out how you can submit your story or tip here.